I passed the PMP exam in first attempt on 24-Feb-2010. As i thought the exam was not very tough, because all the questions are straightforward. There is not even a single negative question that confuse us most of the times, such as "EXCEPT the follwing", "NOT the definition" etc.. I got a question on calculating Critical Path for a complex but very easy network diagram. Also, i got only one question on NPV and EMV. Lot of questions on various Conflict resolutions, Risk management and quite a few on EVM concepts. Preparation - It took nearly more than 7 months for me to appear for the exam. Reasons(Honest) below..
=> Intially i did not commit very much into the exam prepartion. => Postponed the exam more than 5 times due to the lack of preparation between Aug'09-Oct'09. 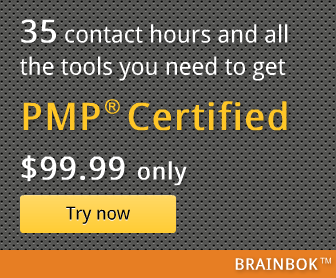 => Went thru various PMP aspirants posts(really boosted me) in Deepfriedbrainpmp blog. => Prepared seriously with complete concentration to appear for the exams in Jan/Feb'10. => Went thru PMBOK guide 2 times. => Always visited deepfriedbrainpmp.com to learn and understand basic yet useful & important concepts. => I did not read any other prep exam books apart from Harwinder's blog. => Oliver Lehman's 175(PDF) + 75 online questions. => Lot of bits and pieces questions from various blogs(around 300 questions). => PMI eReads & References - Books 24x7(If you have PMI membership). => few(5) hours before the exam, make sure to glance all the topics in deepfriedbrainpmp.com(very handy) to remember. Areas of focus - Risk Management, Procurement Management - Various contract types, its advantages and dis-advantages of each contract types. Techniques used in Quality Assurance & Quality Control. Last but not the least Professional & Ethics. Initially i felt very tough to understand some of the terms used in the questions and PMBOK. I usually goto dictionary.com or thesarus(in MS-word) to find out the meaning and understand the question. Later, after practising lot of questions and mock exams, i got used to terms used in PMP questions and other related stuffs. Summary - I would like to thank my good friend Harwinder for maintaining such a wonderful and informational, the best PMP blog for the PMP aspirants. Lots of resources are available in this blog. You will learn around 20% of basic and important concepts while you go thru the PMP aspirants questions and answers. Thanks alot..
All the best for all the PMP aspirants. Suresh and I work in the same department and the same office. Many thanks to him for taking time out of his busy schedule and sharing his lessons learned. These lessons learned were originally posted here. Special thanks for his appreciation and overwhelmingly positive recommendation for my website. One point that Suresh did not mention is that he attended a classroom training (weekend classes) to earn his 35 Contact Hours, sometime mid of last year. Interestingly, he didn't use any exam prep book. Dear Mr. Bhatia and Mr Suresh Babu. Thank you, thank, thank you both for all your help. I wrote and passed the PMP exam on March 8th 2010. Mr. Babu, your posting really made a difference for me. You have a fine mind.